Two weeks ago we released a first article about moderating and our continuous search for new, active and dedicated moderators. As next part of this exciting Moderator Trilogy, we went in depth about the moderator journey with our two most active moderators of this time. Both Mafken & Maus have been extremely active in the past months and deserve this honorable mention. We've had a good talk with both moderators which we glady want to share with you. Maybe one day, they can be your inspiration to apply for becoming a moderator yourself? Want to know what the tasks of a moderator are? Make sure to read our previous article ! We also want to give a big shoutout to the rest of the moderator team. It's those people that make Kayzr what it is today, leading every tournament in the right direction. Thank you very much! Favorite game to moderate: CS:GO, because it's the most challenging! Favorite game to moderate: Rocket League because they have the most relaxed players compared to some other games. Hi Mafken, Hi Maus! Congratulations on being the most active moderators on Kayzr. You've both been moderator for a very long time since the day that we were still BeSports. Why was it that you decided to apply for becoming a moderator? What was your original thought? Mafken: "I found that they had an amazing idea. The concept of organizing tournaments on a daily basis where you can participate for free really grabbed my attention. As soon as the word got spread that BeSports was looking for moderators, I was very excited to become a part of the organization that makes all of this possible." Maus: "Exactly, BeSports in that time was a new and upcoming platform which had my intrest. Trying to help them grow was the next thing to do." No doubt there were tough periods during your moderator career so far. Can you describe your toughest moment and how did you manage it? Maus: "One of the toughest moments happened quite recently, a few weeks ago. A few people were wreaking havoc in a tournament I was moderating. They quite frankly tried to walk over me and cause a big drama. I managed it with my head held up high thanks to the support of the full moderating team and admins who take the moderators back in every case." Mafken: "Well sometimes players don't always agree on the decisions you have to make as a moderator. It's hard to see the full context from each player's perspective and of course sometimes the decision can be wrong. When this happens you WILL get a lot of criticism towards you and it might become really hard to handle and you might even start to question yourself. But in the end we are all people who do make mistakes. Luckily we have 2 awesome Community Managers that will help you back on track. Or you can just take a week off to free your mind and start over fresh." You have been a moderator for a very long time now. What is it that keeps you going? Mafken: "Surely the community behind Kayzr and it's players. Pads on the back from users, moderators, community managers and admins really keep me going. A "Good job Mafken" and a "Thank you" can truly make my day." Maus: "It's my escape from reality. It's a truly great and fun team to be part of. Next to that it still has my full intrest and I am a dedicated person"
To wrap things up, why would you recommend or encourage people to become a moderator? Maus: "One day we will rule the world! Oh and you'll learn to deal with Jasperjokes." Mafken: "Yes! I'd definitely recommend becoming a moderator! Just the fact that you get to meet the people behind Kayzr, have a chat with them and have fun with them truly means a lot. The moderating part itself is a bit more challenging but it keeps me sharp and the other moderators and CM's are always there to help when things get tough." Convinced about the story of Mafken & Maus? Ready to become a moderator yourself and be a part of the Kayzr moderator family? Stop hesitating, apply now! Also a big thanks to Mafken & Maus (Moderators) and Yannickverc & Creativeee (Community managers) for making this article possible. Make sure to drop them a follow! 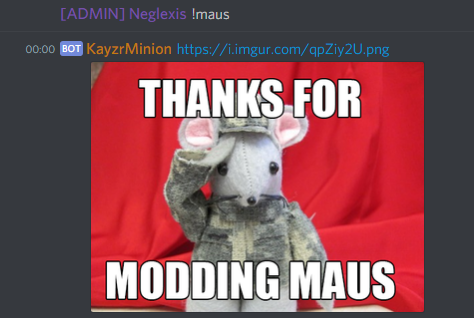 PS: Did you know that Maus even became a meme in the moderator discord?